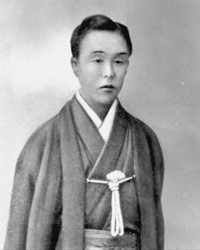 Takashi Koyasu (1836-1898), Industrialist, founder of Nisshusha company in 1870 (changed to The Yomiuri Shimbun since December 1, 1917) and founder of the Yomiuri Shimbun newspaper in 1874 with co-founders Morimichi Motono and Shôkichi Shibata. Overview: In 1870 Japanese Industrialist Takashi Koyasu established the letterpress printing company "Nisshusha" in Yokohama, with the former First Secretary of Foreign Affairs Morimichi Motono and the interpreter Shokichi Shibata, and published an English-Japanese dictionary. In 1874 they launched the "Yomiuri Shimbun" in Toranomon, Minato, Tokyo: the name literally means "sell by reading newspaper", and refers to the newspaper sellers of Edo period (1603-1868). 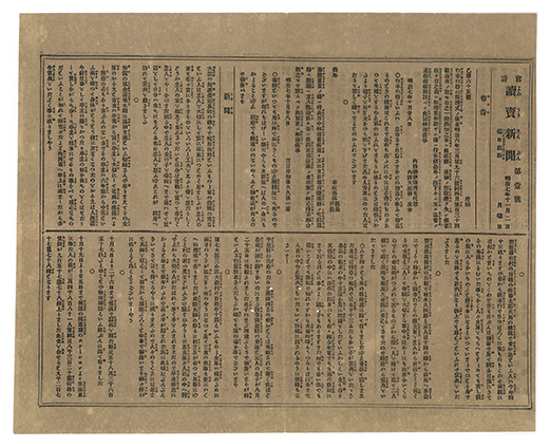 Yomiuri Shimbun was one of five new dailies created early in the Meiji period (1868–1912) to meet the need for a vernacular newspaper in the rapidly modernizing society of Japan. It became popular among the general public for its easy-to-read style, and in the following year its circulation had grown from 200 every other day to more than 10,000; by 1877 it had exceeded 33,400. In the beginning, the Yomiuri Shimbun published literature, novel translations, and some famous writers such as Kôyô Ozaki. 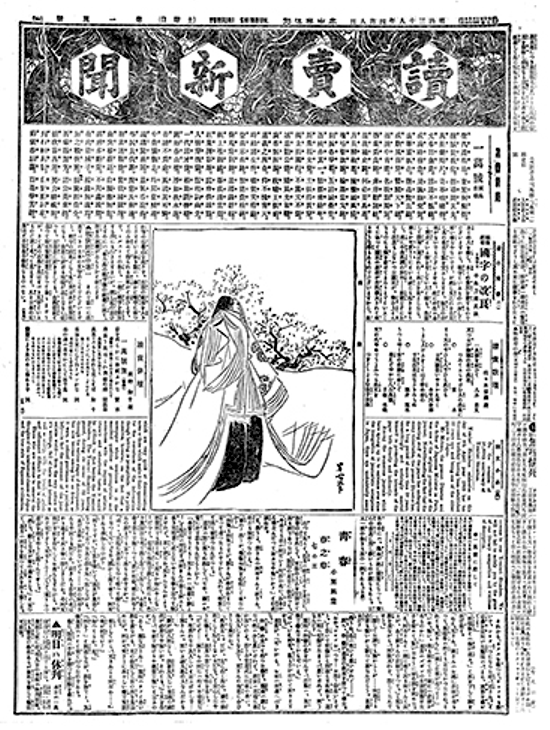 In 1914 the Yomiuri Shimbun creates "Yomiuri Fujin Furoku", a page dedicated to articles for women, the first in Japanese newspapers. On September 1, 1923, the new Yomiuri Shimbun's head office building, located at Ginza 3-chome, was destroyed in Great Kanto Earthquake; in 1945, just before the end of World War II, an air raid burnt down headquarters building a second time; but Yomiuri Shimbun flourished again by building a strong national sales network. 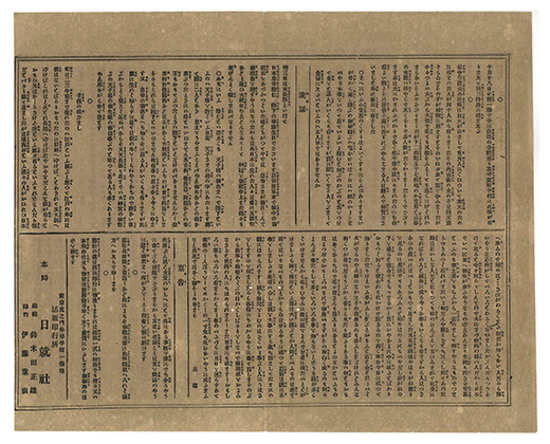 Yomiuri Shimbun was the first Japanese newspaper to carry a news photo (August 7, 1888). 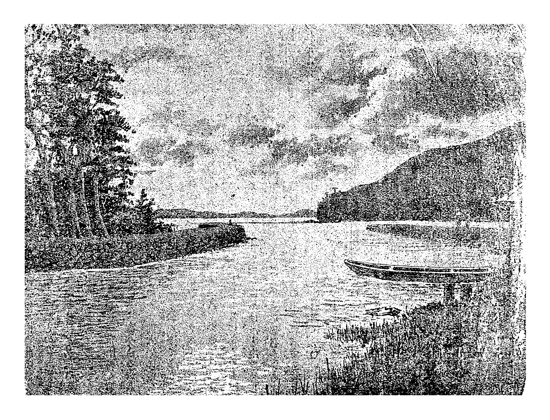 The image, printed using asphalt copperplate, shows the lake Inawashito immediately after the eruption of Mt. Bandai, Fukushima Prefecture. 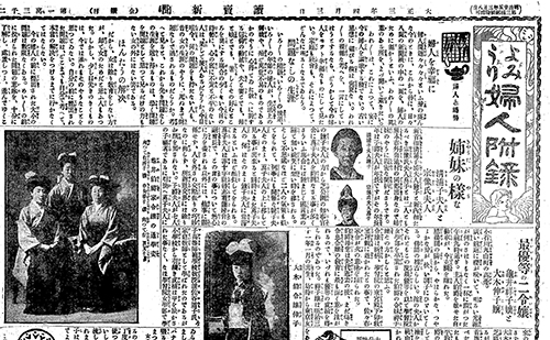 Yomiuri Shimbun was the first Japanese newspaper to introduce pages devoted to women's interests (April 3, 1914). 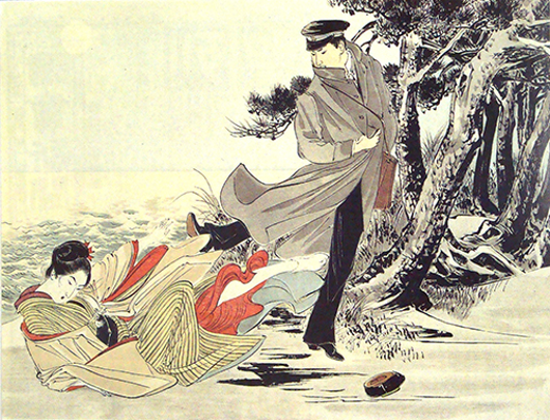 Originally called "Yomiuri Fujin Furoku", these pages evolved into a Lifestyle section. 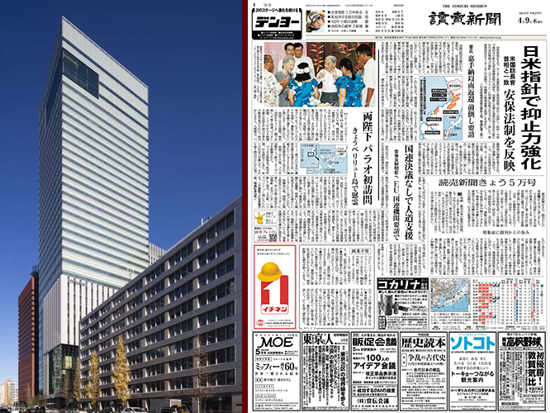 Left: Yomiuri Shimbun celebrate their 140th anniversary (1874-2014) starting operations from the Yomiuri Shimbun Building, their new headquarters in Tokyo's central Otemachi district. Right: Yomiuri Shimbun issue No. 50,000 (April 9, 2015). In 2010, in the Britain's Guinness Book of World Records, the Yomiuri Shimbun was credited with having the highest circulation in the world, and with being the only newspaper to have a morning circulation in excess of 10 million copies: the morning edition had a circulation of 10,020,584, while the evening edition had a circulation of 3,516,692, producing a combined figure of 13,537,276; with an average of 2.5 readers per copy, this results in a total readership of 25,051,460 per day.